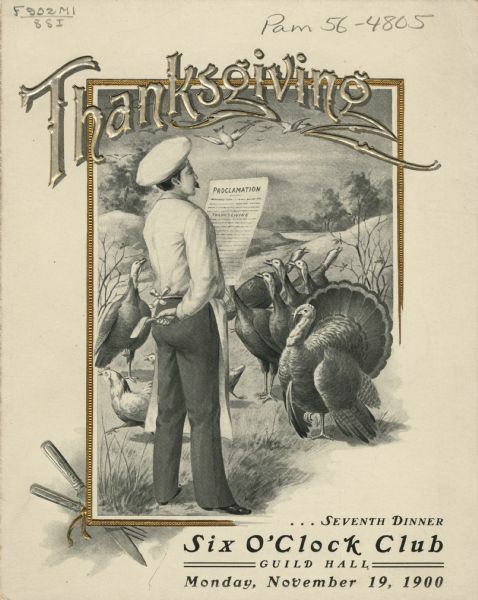 Front cover of the program for a Six O'Clock Club dinner, with a man in a pastoral setting wearing a chef's hat and an apron, reading a Thanksgiving proclamation to an attentive crowd of several turkeys and two chickens which are running away. He is holding an axe in his other hand, behind his back. The word "Thanksgiving," a partial gilt frame, and a crossed knife and fork are embossed. The actual menu may have been a separate insert. The Six O'Clock Club was a men's social and dining club, centered on topics of political and civic interest. For other Six O'Clock Club menus, see Image IDs: 102830, 103636, 103640, 103723, 103784, 103797, 103798, 103802, and 103805.